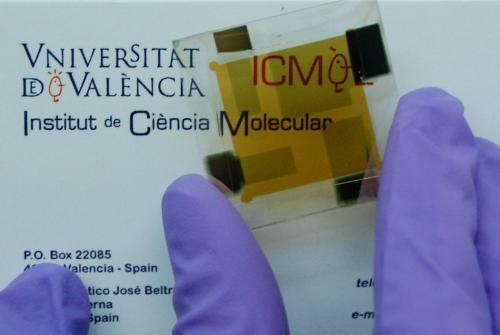 A group of researchers led by Hendrik Bolink of the Institut de Ciència Molecular (ICMol) of the Scientific Park of the University of Valencia has developed a thin film low cost photovoltaic device with high power conversion efficiency. The results of this work, done in collaboration with researchers of École Polytechnique Fédérale de Lausanne (EPFL) in Switzerland, were published in the scientific magazine Nature Photonics. The solar cell developed by the researchers of the ICMol consists of a thin perovskite film sandwiched in between two very thin organic semiconductors. The total thickness of the device is less than half a micrometer, less than a millions’ part of a meter. The hybrid organic-inorganic perovskite material can be prepared easily and at low cost. Hendrik Bolink explains that these devices were prepared with low temperature processes similar to those used in the printing industry which allows the use of plastic substrates such that flexible devices can be prepared. It is also possible to make the device semitransparent which allows their integration with building facades since they are very thin and light weight. In this way the sun light is filtered protecting the building interior from intense sun light while at the same electricity is generated. An 85% of the solar cells that convert sun light into electricity are based on crystalline silicon, an expensive material, whereas the rest use polycrystalline thin film cells, mostly cadmium telluride/cadmium sulfide. These thin film cells are cheaper to produce yet are based on rare and rather toxic elements. Therefore, “the demonstration of high efficiency in thin film solar cells based on abundantly available and cheap materials like as used in these perovskite based solar cells, allows for an increasing share of solar energy in the mix of renewable resources” according to Dr. Bolink. April 15, 2019 - International Workshop on CIGS Thin-film Solar Modules in Paris on May 22/24, 2019 AltEnergyMagExceptional focus on most recent and exciting industrial and scientific developments worldwide. April 3, 2019 - Thin Film Materials - Can They Help the Environment? AZoCleantechRecent advancements in the field of thin film technologies have extended their application well beyond those within the semiconductor industry.